Mm mmm…I almost never order Chinese takeout, but some days I just get that craving for chicken and rice drenched in salty, sweet n’ sticky “brown sauce,” or so they call it. So flavorful, so full of MSG. Oh so unfortunate. The top reason I’d say I cook for myself is so I know exactly what goes into my food. No MSG hiding in this kitchen. 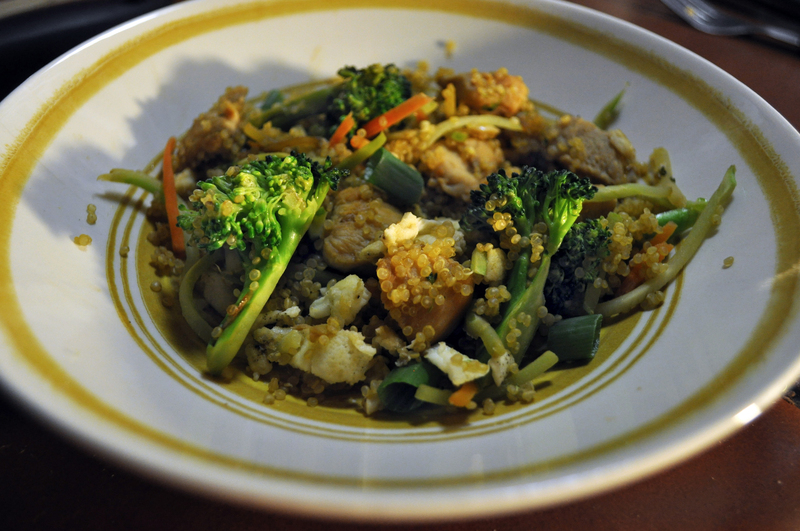 Fortunately it’s very simple to make your own Chinese-style fried rice, and after I saw this variation made with couscous I thought why not use my favorite (and super nutritious) grain: quinoa! 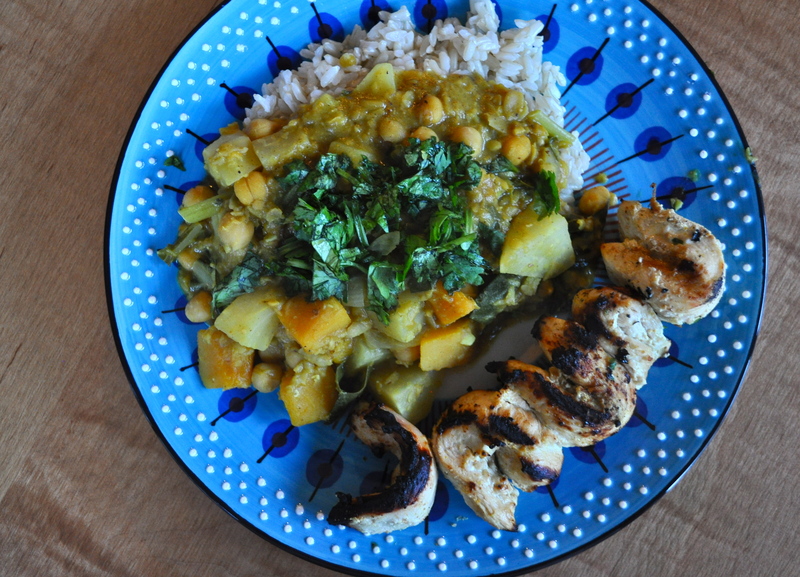 Rather than keeping the numerous ingredients to make Asian-style sauces and marinades, I recently found a store-bought version that I love and is versatile enough to be used for any purpose! Salad dressing, marinade, veggie dip, sauce for rice—pretty much anything you want to have that delicious soy-sesame-garlic-ginger flavor. The brand is called Soy Vay, and I buy either the Veri Veri teriyaki or Island Teriyaki. Both consist of soy sauce, sugar, pineapple juice (in the Island Teriyaki), sesame seeds, fresh garlic + ginger, dried onion, and soy + sesame oils. Basically what I would put in my own marinade if I made it. No preservatives or hard-to-pronounce ingredients. Awesome. The teriyaki works perfectly as a marinade for the chicken in this dish, as well as a drizzled topping for some extra flavor and moisture. Chop chicken breasts into small pieces and marinate in teriyaki sauce for at least 30 minutes. Heat a large skillet over medium heat and coat with nonstick cooking spray. Add beaten eggs and stir with a spatula until scrambled, fluffy and cooked through. Remove to a small plate. 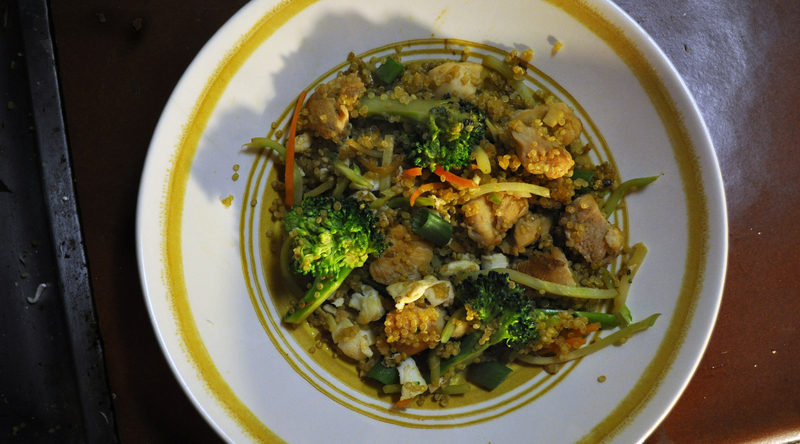 Add 1 T sesame oil to skillet, increase heat to medium-high and add chicken. Let cook for a couple minutes and turn over several times until almost cooked through. 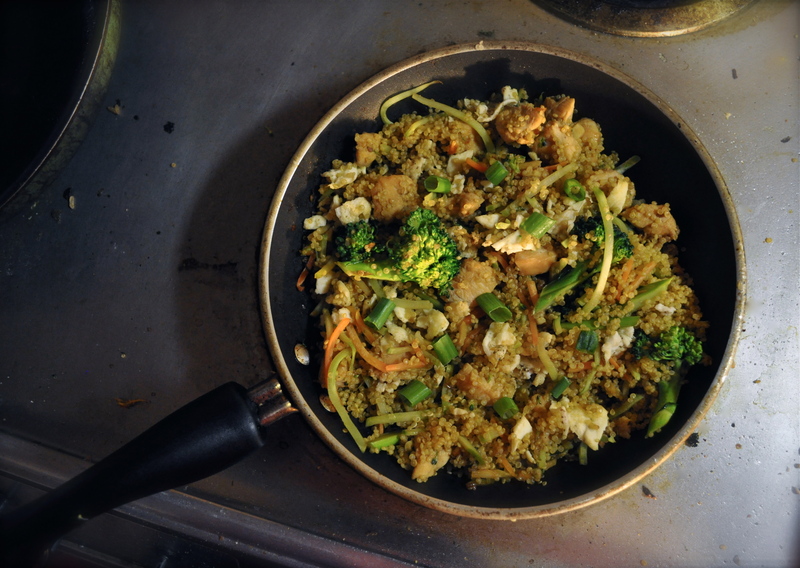 Add ginger, scallion whites and broccoli to skillet, sautéing until slightly softened and fragrant. 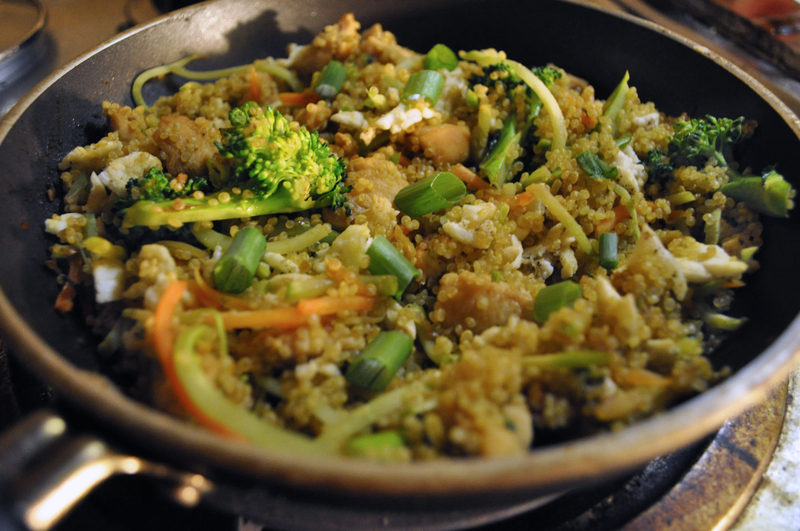 Add broccoli slaw and cooked quinoa, 2 T soy sauce and sauté until heated through, 2-3 minutes. Stir in scrambled eggs, top with scallion greens and serve drizzled with more teriyaki or soy sauce. As someone who is very careful not to waste (any) food that I buy, I like to keep canned chicken or salmon in my pantry. That way I can use it when the craving arises and not get anxious about it going bad. 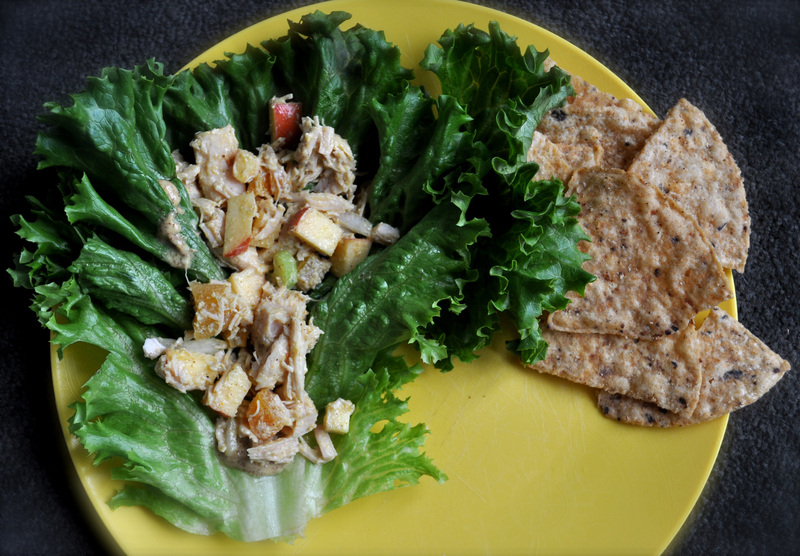 Thus, chicken salad is a practical meal to make and last for several lunches of the week. It’s versatile and can be enjoyed on whole wheat sandwiches, mixed green salads, on flatbread crackers, lettuce wraps, or straight out of the bowl. 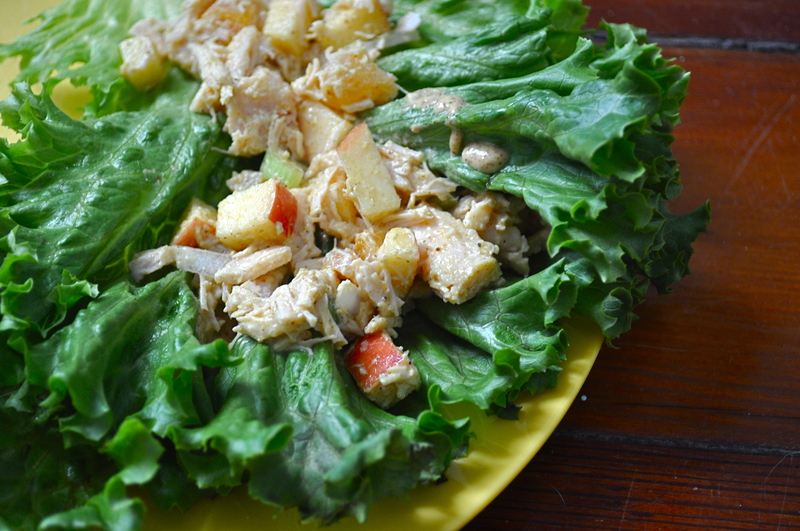 I have come up with my perfected chicken salad, — a mixture of fruity, cool and spicy flavors. Crisp apples, chewy dried apricots, crisp onion and celery, creamy tart yogurt, and warm curry and garam masala. I ate mine for lunch in big lettuce leaf wraps, making for a light and refreshing midday meal. These measurements are all estimations; I’m not sure of the exact proportions I used. 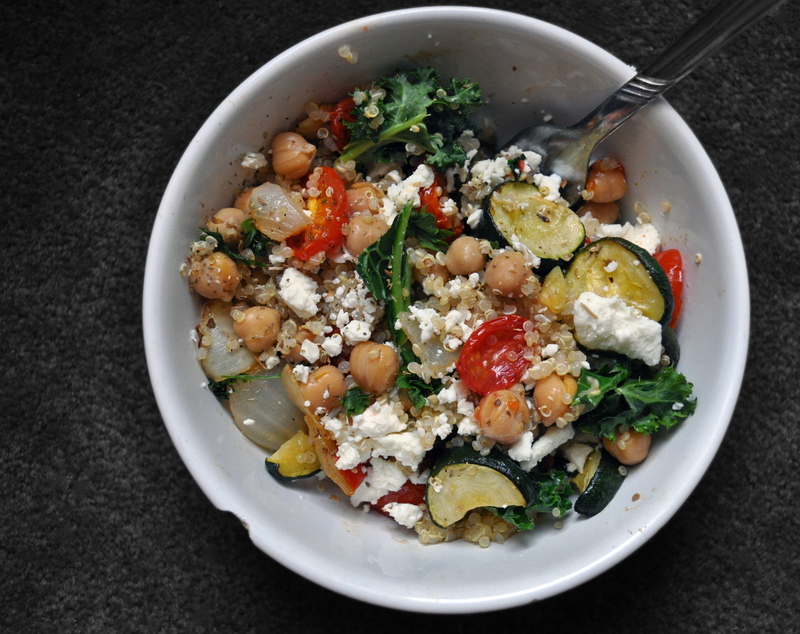 Just throw everything together in a bowl, adding more of what you like, different fruits or veggies, more spice, less spice, whatever tastes good! Make it your own. Stir together with a fork, season with salt and pepper and enjoy.